Colocasia, better known around the world as Elephant ear plant has been around for centuries together and is widely used in Kerala in a variety of recipes.This underground root otherwise called corm is edible and is free from gluten. 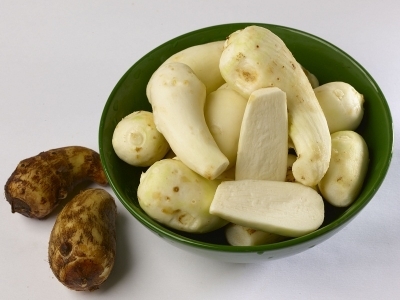 Saro Colocasia is high in potassium that is required to boost body fluids.This starchy vegetable is quite tasty when steamed, fried or smothered with seasoning. With enough vitamins, Saro Colocasia is best used as a curry and served hot with rice. © Mathewsons. All rights Reserved. Website Design , Website Development, Web Hosting by INI Technologies Pvt Ltd, Cochin, India.